There has been a new spate of racist attacks across Belfast, with the Polish community being particularly targeted by loyalists. While anti-Catholic attacks have continued, the number of racist incidents in Belfast jumped by 50% last year, with over 450 such attacks. Polish nationals are often singled out by loyalist attackers as most likely to be Catholic. Late last month an elderly Polish couple were attacked and verbally abused on a Belfast bus. Last week three homes belonging to Polish citizens were attacked in north Belfast. There was also a devastating arson attack this week on an east Belfast business followed the appearance of anti-Polish graffiti on a nail salon, although it is actually owned by a woman from Lithuania. The Polish government has expressed its serious concern about the escalation of racist attacks against its citizens living in the North, while the PSNI police have shown little disinterested. Honorary consul for the Six Counties, Jerome Mullen, said Polish people faced an “intolerable situation”, adding “it cannot continue”. “The Polish community is the largest ethnic community living in Northern Ireland, they have come here to work hard, to earn a living and to make a living for their families,” he said. More than 100 anti-racism campaigners attended a rally in east Belfast in support of the Lithuanian salon owner whose business was destroyed in an arson attack. Asta Samaliute broke down in tears as campaigners gathered outside her salon on Castlereagh Street. Asta’s ‘Glam Factory’ was attacked shortly before midnight on Monday. A loyalist paramilitary gang forced the shutters up, poured an accelerant inside and then set it alight. No-one was inside at the time. The arson attack came just days after graffiti saying “Polish out” was daubed on the shop front. 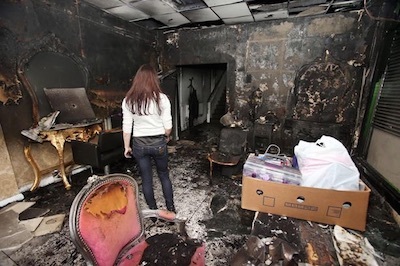 Speaking from her salon, which has been extensively damaged by the fire and smoke, she said she had been left devastated by the attack that may also put her forthcoming wedding on hold. “I am supposed to be getting married in four months in Greece, but that might not go ahead now, I don’t know now,” she said. Asta said her business was a “multi-national salon”, where she employed two Lithuanian women and another two from Belfast. Asked what message she had for those responsible, she said: “They really should be ashamed of themselves”. “I am trying to make a business, I have worked so hard all my life, I have put everything into this salon and now it’s all gone,” she said.